Hans-Otto Johnsen was very skilled already in his youth keeping old American cars and trucks going. That skill can be very handy for a commercial beekeeper. For many years he worked as an expert on explosives, but he got poisoned by nitroglycerine and had to change his job for making a living, so he turned to beekeeping. For a number of years he worked as a technician under Prof. Stig Omholt in Norway and at the same time developing his commercial operation. 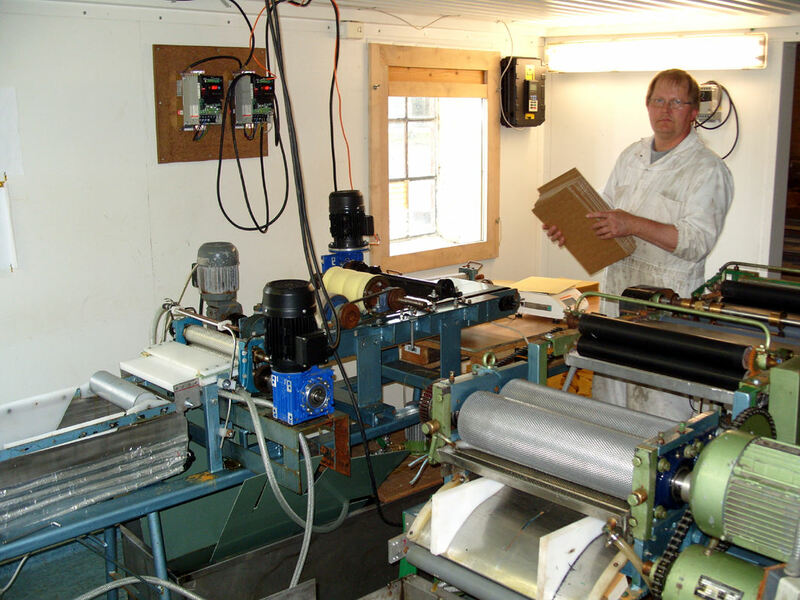 His experience from these years has helped him in developing his Varroa resistant bee stock. A good brood comb in one of his Norwegian type of combs before he switched to medium Langstroth size. Quite soon he got to know me and wanted Elgon stock to work with. He imported quite a number of splits from me. He kept track of the Varroa levels in the colonies and stopped using any type of chemical to fight anything in the hives. He wanted his bees to develop their ability to survive, which they did. 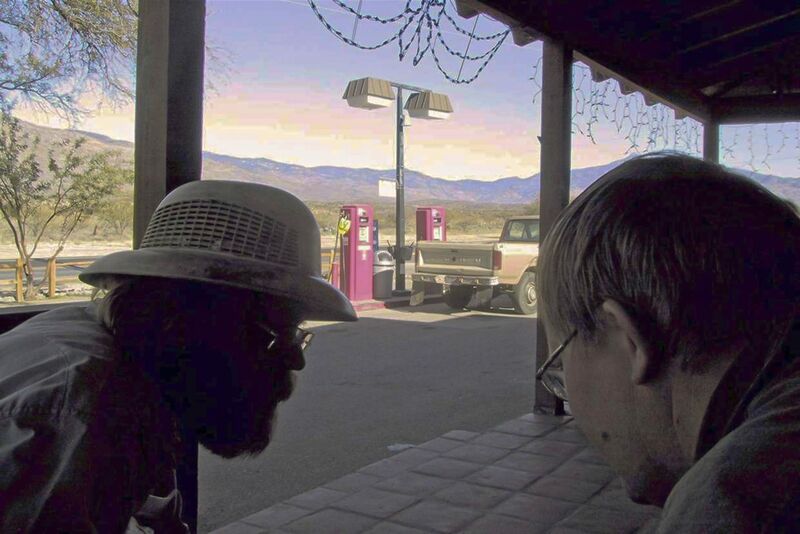 Ed Lusby and Hans-Otto discussing small cell beekeeping at a fuel filling stop on our way to one of the apiaries of Lusbys’ in the Sonoran desert. We travelled together several times to America and studied small cell beekeepers and wax foundation producers. Hans-Otto bought equipment and started producing wax foundation, small cell and large cell as well as different sizes of drone foundation. His mechanical and engineer abilities showed themselves to be very useful as he changed and improved the equipment, for example the cooling of the drum for producing rolls of uniform sheet for feeding the plain and foundation rollers. Also the setup of plain and foundation rollers needed according to his opinion more controls of individual speeds for different parts of the production process, which he included in the setup. 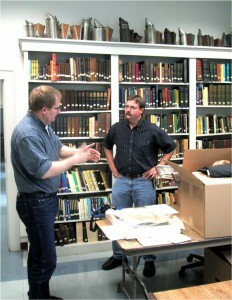 Hans-Otto and Gary Dadant discussing wax foundation production during a visit with Dadant’s in Hamilton. He started to plan and set up different tests for looking at the effects of different cell sizes in brood combs and to produce virus free drones to mate with virgin queens. He saw that bees easier recognized (and removed) when drone brood was infested with mites when these cells were smaller, which they naturally are with smaller worker brood cells. He also saw that mites more readily infested the biggest drone cells. Today Hans-Otto has research money from the Department of Agriculture in Norway. He developed his bees in quite isolated areas, but not totally isolated, so sometimes the bees were mated to carniolans, buckfasts and the native brown bee (Mellifera mellifera). 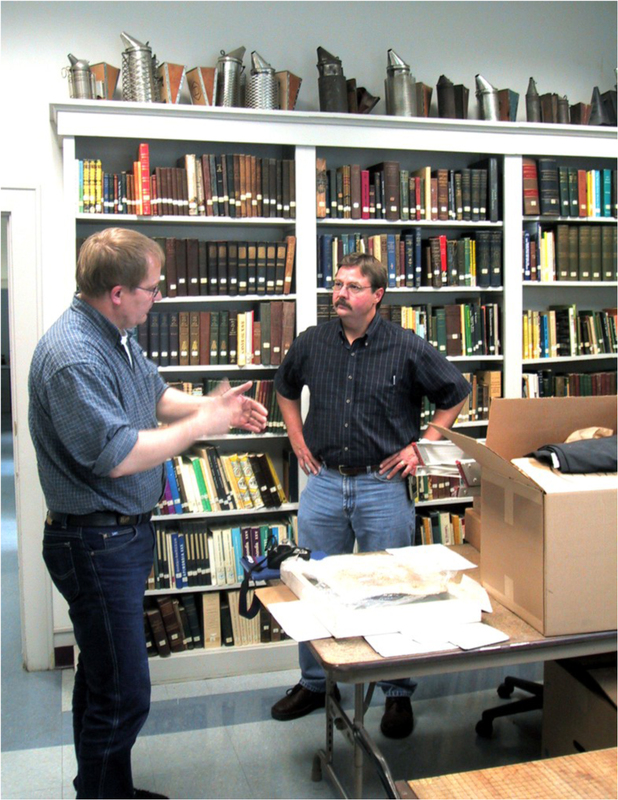 He also worked together with Terje Reinertsen, another Norwegian beekeeper, very similar to him when it comes to beekeeping. They exchanged breeding material. Both of them have discovered that their bees teach other bees how to get rid of mites. It seems this ability to teach new bees is very important knowledge when developing a Varroa resistant stock. Today Hans-Otto hasn’t treated his bees now for at least 12 years. The levels of mites are normally very low in his and Terje’s colonies and he never sees any wingless bees. In 2014 the bees of Terje were tested for Varroa levels by the Norwegian Beekeeping Association in preparation for planned research. (Birøkteren, vol 131, 2015(1), pages 13 and 24. The Bee Journal of the Norwegian Beekeepers Association.) The levels were so low it was difficult to calculate the reproduction rate. When Hans-Otto moves his bees to the heather in late summer, for producing heather honey, his bees quickly pick up quite some mites. The natural downfall of mites will then be higher until about a month before the frost will make the bees form winter cluster. Then the downfall is almost zero again. In 2010 Georgia Pellegrini (https://en.wikipedia.org/wiki/Georgia_Pellegrini) published her first book on natural food: Food Heroes (http://www.amazon.com/Food-Heroes-Culinary-Preserving-Tradition/dp/1584798548) She included a chapter about Hans-Otto and his focus on natural production of honey. For example he concludes that small cell bees are more biologically optimized than large cell bees. Thus research done with small cell bees are more reliable concerning what bees are and how they react naturally. In short, research results with small bees are more reliable. In this context it’s interesting to notify that Norwegian wax is almost pesticide free. An important part in his quality control is producing wax foundation as he thinks will be the best help for the bees. Today we understand that adaptation of bees to fighting Varroa isn’t only selection breeding, natural or beekeepers’, for changing the DNA composition, but also epigenteic adaptation, the change of expression of the DNA as a result of changed environmental pressure on the bees. 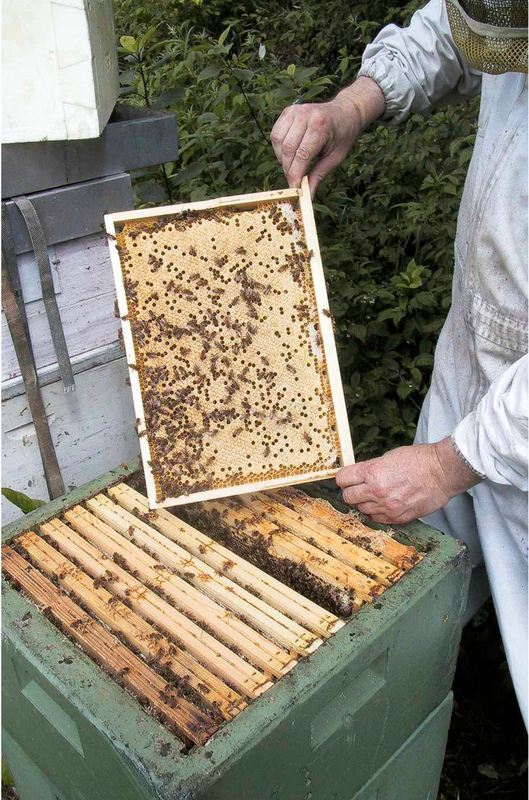 This turns the focus to the importance of locally adapted bee stock. Now research is going on with a third adaptation step, how bees learn how to deal with challenges and how they pass on this knowledge to other bees, worker bees to worker bees. Hans-Otto caught a carniolan swarm of not resistant large bees that choose one of his swarm traps for their new home. After establishing this swarm in one of his apiaries he shifted its place with one of his resistant colonies. So this nonresistant colony received the field bees of a resistant colony. Afterwards they both behaved like resistant colonies. One year he bough buckfast virgin queens not selected for Varroa resistance. He put them in splits made from his bees. The virgins mated in his apiaries. These splits were spread out in different apiaries of his. For two years they kept their colonies working fine and resistant to mites as good as his other colonies. Now these two experiments absolutely are food for thought. Definitely Hans-Otto Johnsen is worthy of more than the 15 minutes of fame, one commentator thought was enough. This entry was posted in Breeding, Cellsize, Disease resistance, Elgon, Treatment free, Varroa resistance, Wax and tagged cellsize, chemical residues, epigenetics, genetic variation, locally adapted bees, small cells, Social learning, varroa resistance by Erik. Bookmark the permalink. I take the ball from your Statement “Food for thoughts”. Indeed your last article was…:-). 1. Epigenetic effect. Johnsens findings are indeed interesting, as they provide evidence that bees need to learn how to fight against varroa and can forward this Information. From my perspective it would be worth to discuss his investigation on this topic in more detail. Alternatively, you may provide the original research papers, if in english. 2. Cell size: The effect of drones as mite trap, have been suggested by Lusby’s. Moreover, Stephan Braun has demonstrated with his bees on the Canary Islands, how that work in more Detail – http://resistantbees.com/falle.html – unfortunately only available in german. He opened drone brood cells, in the way suggested by your blog and found that mites are concentrated in some drone cells but not in others. With other words, he could show that mites are concentrating in drone cells, but surprisingly they seem to bulk in some cells in not in others. The consequence of this behaviour is, that the number of offspring is limited, which effectively reduce the reproduction rate of mites. The question is, why are mites concentrating in some drone cells and do not evenly distribute all over the other drone brood? It was discussed, that this should be triggered by any king of chemical, maybe JGH (juvenile growth hormone), which was found to vary within drone larvae by 3-7µg/ml (paper of Rutner et al.). Maybe this is this JGH or something different, which vary and therefore provide different attraction to mites. Reading your blog and Hans-Ottos experiments, it seems that cell size of drone brood is another trigger, that attract mites to enter. Hence, the question is, is the drone cell size varying even per comb or did you mean varying drone cell size between different hives? And the next question would be, if it is varying drone cell size per comb, how was he able to measure this precisely?